A good blazer has been known to get us through fashion dilemmas in any season. And the S/S 18 runways brought that sentiment to life, as the season’s most prized pieces were powerful blazers. From Gucci to Céline, designers rejuvenated the 9-to-5 in many ways, from deconstructed versions to belted additions and trending pastels. In fact, the array of styles was so vast that there was something to suit every sartorial taste. Lucky for you, you don’t have to wait until spring to take the updated styles for a spin. We’ve rounded up 14 fresh options that will power you through your workweek and help you climb that corporate ladder in style. 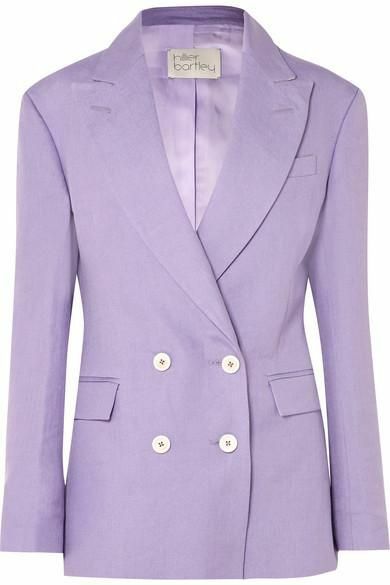 Wear yours in spring’s must-have color: lovely lavender. Available in sizes 6 UK to 12 UK. We love the cute sleeve detail. A fresh and modern pop of pastel pink will keep you inspired throughout your workday. Your denim jacket just got a seriously chic upgrade. Available in sizes 34 FR to 46 FR. Bright and bold colors are the name of the fashion game this spring. Put a smile on everyone’s face in this lively yellow number. Swap your gray checks for this refreshing blue. From desk to drinks in style. Olé! Available in sizes 36 IT to 46 IT. Opt for a lighter linen fabric for the warmer days ahead. The staple black blazer gets a super-chic upgrade with contrast white buttons and decorative seams. Pair this peachy longline blazer with a light gray knit dress for work and white denim on the weekend. A cream blazer exudes sophistication. Available in sizes XL to XXL. Pink and red were huge on the S/S 18 runways. Try wearing the cool colors together in gingham or checks. Rounding out the list is this fun selection with incredibly chic buttons. Who could resist? Available in sizes 6 UK to 14 UK.